1. Preheat oven to 180°C / fan 160°C / gas mark 4. 2. Add the bacon to a frying pan and fry over a medium heat for 5 minutes or until the bacon is cooked. Leave to cool while making the pizza base. 2. Heat the olive oil in a small frying pan over a low-medium heat. Add all the filling ingredients and lightly fry for 10 minutes until minced beef is browned and cooked through. 3. The mixture should be dry, set aside to cool. 1. Add ground almond, butter andMCTprocal™ into a bowl. Rub together with finger tips until a crumbly texture is achieved. 2. Add water and mix with a spatula to form a ball shaped pastry-like dough. 3. Using an A4 sized piece of parchment paper, set the ball in the centre of one half, fold the other half of the paper over the ball, flatten out and roll with a rolling pin to a create a circle shape with the dough, approximately 3mm thick and 12cm diameter. 4. Peel back parchment paper from pastry surface and add cooled filling to one half of the pastry circle, leaving some room at the edge. Moisten this edge with water and fold the pastry over the filling. Crimp the edge using your fingers or fork. 5. Place the uncooked pasty on a baking sheet and bake in the oven for 20-30 minutes until golden brown. 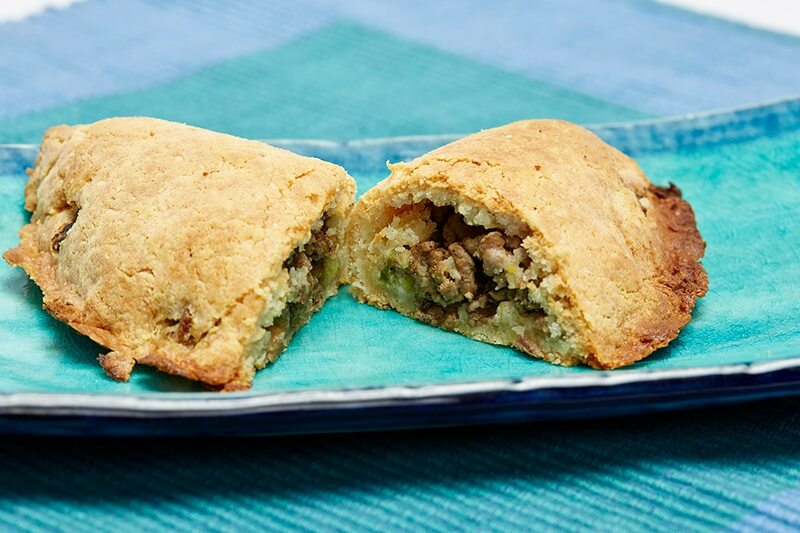 To download the Beef Pasty recipe card click here.